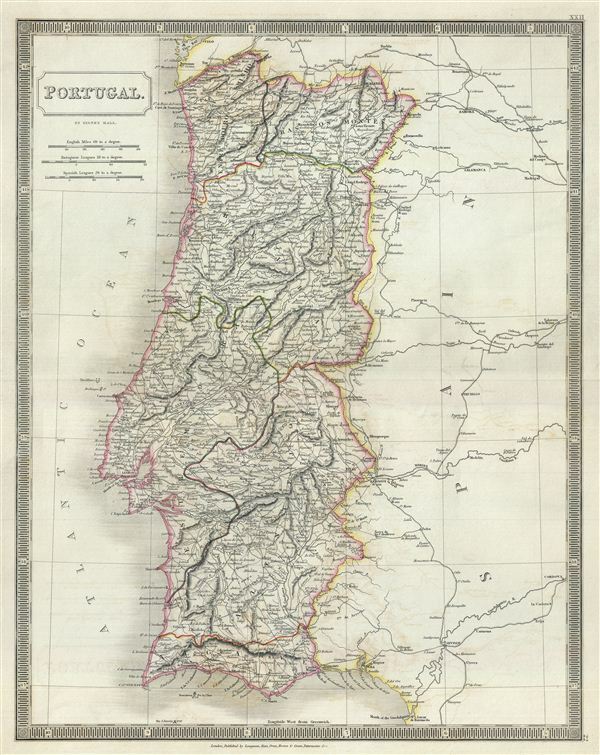 This is a beautiful map of Portugal from Sidney Hall's extremely scarce 1835 New General Atlas. It covers the entire nation of Portugal as well as parts of adjacent Spain. The map identifies several battlegrounds throughout, including the 1702 Battle of Vigo Bay or Rande during the War of the Spanish Succession, the 1759 Battle of Lagos during the Seven Years' War, the 1812 Siege of Ciudad Rodrigo, and the 1811Battle of the Gebora near Badajoz, among others. Towns, rivers, mountains, railroads, canals, marshes, forests, and various other important topographical details are noted. Elevation throughout is rendered by hachure and political and territorial boundaries are outlined in color. This period depicts in Portugal follows closely on the War of the Two Brothers. In 1826, Peter IV of Portugal abdicated his thrown in favor of his seven year old daughter Maria da Gloria, on the condition that she marry her uncle (Peter's brother) Miguel. Miguel deposed Maria and proclaimed himself king, which led to the Liberal Wars, and eventually resulting in Miguel being forced to abdicate and go into exile. Maria da Gloria was proclaimed queen in 1834 and resumed her reign as Maria II of Portugal. Rumsey 4224.023 (1830 edition). Philips (Atlases) 758. Ristow, W., American Maps and Mapmakers: Commercial Cartography in the Nineteenth Century, p. 303-09.